Movie: "Barbershop 2: Back in Business"
The Barbershop is once again facing the threat of closure when a national chain called Nappy Cutz moves in across the street. Fearing the chain will steal all of his business, Calvin (Ice Cube) attempts to update his shop and change the environment before his competition's grand opening. 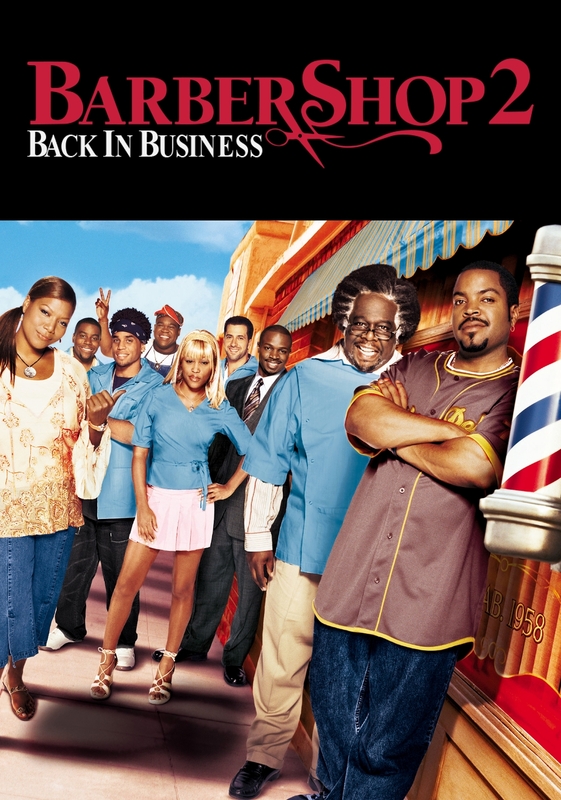 Kevin Rodney Sullivan takes over the directorial duties for "Barbershop 2: Back in Business." The entire crew is back reprising their parts in this sequel, however, many have changed their attitudes and jobs since the first film. Isaac, played by Troy Garity, is now the most sought after barber in the shop and has become a bit of a diva because of his popularity. Terri, played by Eve, has worked on becoming a more calm, centered person. Jimmy, played by Sean Patrick Thomas, has left the haircut business and has begun working in the office of the local alderman. Calvin, played by Ice Cube, is now totally focused on his barbershop. Ricky, played by Michael Ealy, is continuing his path of bettering himself and is also working on his GED. This time around, Queen Latifah joins the cast as Gina, who works at the beauty shop near Calvin's barbershop and definitely has a past with him. There are some people who haven't changed, like Dinka, played by Leonard Earl Howze, who is still a lovable sweetheart, and Eddie, played by Cedric the Entertainer, who is his same boisterous, old, outspoken self. The acting is about the same as it was in the original, maybe with a smidgen little less oomph, but it's barely noticeable. A couple of performers have not missed a beat, Cedric the Entertainer being one of them. Since the film relies most heavily on its characters, we'd say it's still relatively successful and the least concerning part about "Barbershop 2: Back in Business." This time around, Eddie has become a major focus as we finally learn how he came to work in the shop and why he pays no booth rental fee. We are shown a series of flashbacks which tell his backstory, including a shoehorned in long lost love story that we didn't quite care for in the grand scheme of things. In the context of the film, it doesn't add much to the overall plot, but it's not a horrible waste of time, either...it's just sort of there. Unlike the first installment, this second story takes place over several days and is interwoven with the aforementioned flashbacks, which creates a bit of a disjointed feel to its narrative. The overall theme involves gentrification and how the revitalization of some areas by bringing in bigger businesses and improving landscapes can have consequences. Namely, this prices the current residents right out of their own neighborhoods, including Calvin and his barbershop, which is now being threatened by a newer, bigger, more up-to-date Nappy Cutz, a national barbershop chain. This greater message unfortunately gets lost in the grand scheme of things, mainly over the success or failure of this one local business in particular. Overall, the story this time around is kind of a mess and lacks focus. The laughs are still there in this sequel, but are now much more sparse. Though they are there on occasion, they come fewer and far between. The entire thing ends on a great high note, but we're not really sure how much a fourth installment can bring to the table 11 years later. One year ago, we were watching: "The Rat Pack"